I get a lot of invites to be “friends” with bands and musicians on MySpace. We all do. That is one of the cool things about MySpace, the chance to learn about new artists that you might never have heard of. OK, so yes, there are plenty you don’t want to hear of, but that isn’t the point. So while browsing through friend requests the other day, I come across one featuring a picture of an attractive and leggy blonde girl. Naturally I clicked on the link to see who this was (no, not because of the girl, get your minds out of the gutter) since it was from a band calling itself “From.” When I say itself I should really be saying herself as From is a one-girl band, comprised of vocalist/programmer Roni Brunn. As I looked at the page, I was caught up in the minimalist throb of a synth and guitar droning from the page’s background music player through my comp’s speakers. 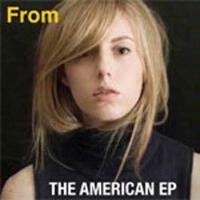 So after accepting Brunn/From as a friend, I followed her handy link to iTunes where I downloaded the American Girl EP. The sound is decidedly indie and low-fi, reminding me of a female led version of Suicide, circa-1982. If you are feeling daring, as I was the other day when I happened across the band’s MySpace, plunk down a couple bucks and download a couple tracks of DIY indie rock. Please note: MySpace did not give me any kick backs for saying nice things about them, even though Tom is one of my friends. The opener is also the longest number here, featuring a pulsating computerized bass effect and distorted harmonic hypnotic guitar riffing. Brunn’s voice is fairly reminiscent of early 80’s English New Wave with a moody pout in her delivery at times and a delicate girlish quality in others. Think Altered Images meets Kate Bush. This is one of the more fleshed out songs musically on the release with a programmed drum and bass and Brunn’s characteristic brooding distorted synth and guitar backing her. The song has single potential as evidenced by the radio edit later on the EP. Definitely not Tom Petty’s song, this New Wavey number is what caught my attention when I visited her MySpace. Kicking off with a bouncy mechanized drum step and retro synths, the sound is rounded out by some cool harmonic guitar riffing from Roni Brunn’s brother Dan Brunn. Roni Brunn’s singing is strongest here with plenty of girl power angst and energy. If you have a thing for bouncy indie electro or modern retro New Wave, drop a buck on this track. Clocking in under two minutes this number mixes up the sound a bit with a beatnik drum and bass dance hook and lighter synths on top. There are slightly more effected and breathy vocals from Brunn than other cuts. On her MySpace Brunn describes From’s sound as being like Stone Roses and Madonna or Echo and the Bunnymen and Bananarama. Brunn uses double tracking of her own vocals here to create a unique dis-harmonizing effect and help back up these comparisons. This is the same song as above with the naughty words taken out.